We all have stops along the way. They’re what make us ultimately who we are. And my stops brought me here, to a writing life. It took longer than probably most authors’ experience, but I’m here nonetheless. So let me tell you about my stops, or rather the times of my life that brought me closer to being an author. I love to read and started at a young age. First my mom and dad read to me, then they taught me to read for myself. By the first grade I was probably considered an obsessive reader. In fact I won an award for reading the most books that year. But I didn’t stop there. I kept reading, advancing from bunny and puppy stores to Nancy Drew Mysteries. Then, one evening in my pre-teen years, my mom gave me a 1939 edition of Gone With the Wind. The cover was tattered from age; it had obviously been well-read and well-loved. She said she treasured it and hoped that I would too. I remember asking her why I’d never seen this book before, and she answered. “Because you weren’t ready.” Bless her, she knew my penchant as a child for marking in books. Of course in my mind I was enhancing them with my illustrations… but that’s another later stop. Well, from that point, reading was my passion. I truly can’t remember a time in my life when I didn’t have at least a dozen novels stacked on my bedside table. Except for college. That stop got me off track, at least for fiction. Too many things to learn, too many outside influences… you know, like boys and fun. And beside I wanted to be a great archaeologist. I didn’t think fiction would get me there. It may not have gotten me there, but it sure got me somewhere else! My next stop came as I began my life as a military wife. I found myself in a third-world country even before I knew what that meant. I spent almost three years on the island of Luzon in the Philippines. When we weren’t traveling, I was haunting the base library until there were no more books to read. And I was watching the people, soaking in the culture as I’d learned to do as an anthropologist. Guantanamo Bay, Cuba was my next stop on the journey. For four years I snorkeled, partied of course, worked occasionally, and read obsessively. The base library was again my friend. The next stop was a sad one but ultimately got me back on my track to writing. A divorce, being a young single mother, and back to my roots… Texas. After a few years of struggle I was able to go back to school and obtain an MA in Anthropology again thinking I could be that famous archaeologist, this time with my young son by my side. Okay, now the stops got closer together. I was writing… technical reports, research papers, a master’s thesis, raising my son… but at the same time I found out that illustrating a book (as I did as a child) could be an actual profession in and of itself. I became a rather well-known Archaeological Illustrator. That stop was fun, but it wasn’t writing. For many reasons, and the details should go into a memoir and not a blog, I left that stop searching for something else. So I said, “Okay,” and we did. Not as easy as it seems though… there’s an actual class sponsored by The American Booksellers Association: How to Open a Bookstore. It’s true. And even after that class with the dire warnings about our success or lack thereof, we found a location. But we knew we needed a hook… just like in a book. You have to ‘hook’ your readers within the first few pages or they won’t continue. Our hook was wine. Yes, A Thirsty Mind Words & Wines was founded. We think it was the first bookstore/wine bar in the country. I don’t have proof of that, but we certainly didn’t see any other bookstores like ours. Not much to go on, I know. But using my skills as a researcher, honed in graduate school, I found it… Brunelleschi’s Dome: How a Renaissance Genius Reinvented Architecture by Ross King. I even amazed myself! During this stop as a bookseller I got to write again. Blogs, newsletters, advertisements. And I got to meet authors. We had many events in the shop featuring local authors as well as others traveling the country on book tours. It was inspiring. I loved that bookstore, it was my life. But there were more adventures ahead for me. So when Amazon got so popular and the economy crashed… not related of course… I closed my shop and went on my way to my next stop. Well, of course I could, but this was in the early days of indie-publishing and the rules were changing quickly. Lucky for me there were already guides online with tips on formatting, not many but they were useful. So my new stop… A Thirsty Mind Book Design. However, another upheaval in my life came along just a few months later… I could no longer afford my perfect Texas house. Actually it was the taxes I could no longer afford, particularly in the early days of this new business. So I packed up and moved north to Maine, to a piece of property I’d owned for many years, actually from my military wife years and the divorce. A small farm on the coast of the most eastern piece of land in the U.S. The perfect place to build my business as a formatter and self-publishing consultant. All I needed was the Internet and a laptop. I wallowed there in contentment for a year or so, then after all that time studying sentence structure, word usage, as well as formatting, I thought to myself. “I have thousands of stories running around in my head. Why don’t I try to get them out? It’s no longer necessary to find an agent or publisher, thank goodness. I can do this by myself. 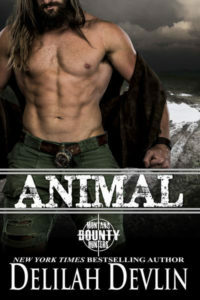 I can be my own publisher!” So for six weeks between formatting and editing jobs, I wrote. After those exhausting weeks, I thought: I’ve written a novel! What do I do now? Well, the now was solved by another phone call. Would I like to be on a panel at the NINC conference in New York in October? NINC of course is Novelists, Inc., an organization of published authors. Of course I said yes. 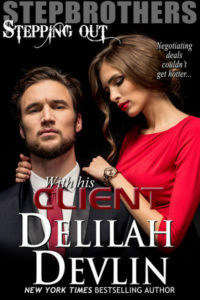 I could talk about self-publishing and all that I’d learned, and I could meet authors! NINC was an eye-opener. You could make money as an indie-author… but it was hard work. And writing more books than one seemed to be the key. And there were contests to join, beta readers to find, mentors. Obviously my book was not done yet. But I was almost into the station. 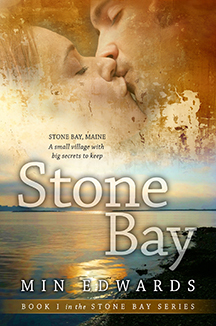 A year and a half later, after 16 more versions of Stone Bay, I formatted and published the book to Amazon. Then I sat back and watched it… do nothing. After agonizing over that for a couple of months, I was reading an issue of the RWA newsletter (Romance Writers of America) and found in the classifieds a couple of editors’ ads. I contacted one and asked if she would look at Stone Bay. Something was wrong with the story, and I couldn’t figure out what. She said yes and a few weeks later I had a much better book. I understood POV (Point of view), conflict, timing… well better than before anyway. I was learning my craft, my last profession/stop. 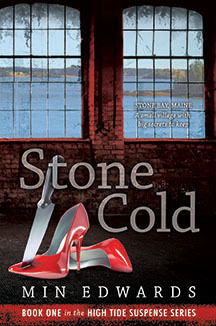 A few months later (and with the help of an editor before publication this time) my second book found its way to Amazon; Stone Cold, a romantic suspense. Now a few months after that book, my third book, Stone Heart, is in final re-writes with my editor, and as soon as my incredible cover artist finishes the print and digital covers, it will be winging its way to readers worldwide. You might ask, how did all those stops along the way help you get to the final station as a writer? Reading. Reading. Reading. Research. Art. Marketing. Learning a craft. Education. And my Mom. I’ve taken her name as my pen name, Min Edwards, because she was the start of it all. She read to me. She taught me to read. She gave me Gone With the Wind.